Taking out a funeral plan is not only one of the most thoughtful and caring things you can do, it provides real financial benefits too. Planning for later life is never an easy thing to do, but it can be comforting and reassuring to know that you've taken care of your arrangements, including your funeral. By taking some time now, you can provide both financial and practical help for your loved ones in the future. Many people never get round to talking to their families about the kind of funeral they would like. A Perfect Choice pre-arranged funeral plan from T. C. Rogers & Son is a simple and straightforward way of removing this worry and can provide real peace of mind for you and your family. Please be aware that we do not telesales or send representatives to SELL you a funeral plan like other funeral plan firms . 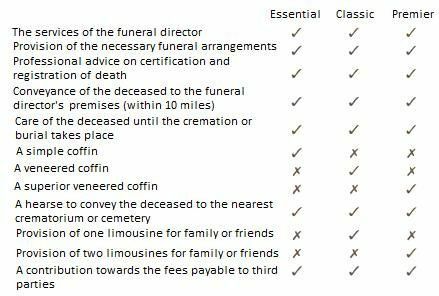 The only way you can have a Perfect Choice funeral plan is by you contacting us as an approved Perfect Choice Funeral Plan funeral director. Perfect Choice do not tell you which funeral directors to use. Our funeral plans are the best priced funeral plans with no pressured sales who ask for payment on the phone, our plans are designed exactly to cater for the funeral you choose. More importantly you only pay for what you choose with no other marketing or sales fees added on because there are none. So please contact us for your funeral plan. We are pleased to offer this as one of the lowest priced funeral plans available in the Padstow, Wadebridge, St. Merryn, Trevone, St. Issey, Treyarnon, Constantine Bay, Porthcothan, Camelford, Tintagel & Port Isaac areas. Perfect Choice Funeral Plans are provided by NAFD Services Limited which was set-up by the National Association of Funeral Directors (NAFD) whose member firms carry out over 80% of all funerals in the UK. NAFD Services Limited is a founding member of the Funeral Planning Authority, the official body that oversees the operation of companies offering funeral plans. Perfect Choice Funeral Plan funds are held securely in a guaranteed whole of life assurance policy. For maximum security NAFD Services only works with UK-based life assurance companies that are authorised by the Prudential Regulation Authority (PRA) and regulated by the PRA and Financial Conduct Authority. A key difference with Perfect Choice Funeral Plans is that the pre-payment monies cannot be used for anything other than the clients funeral for total peace of mind. T. C. Rogers & Son are one of the longest-serving Cornish family funeral directors conducting funerals in the North Cornwall area since 1911. Our family are proud to provide caring bereavement support and funeral services to local families. We cover the Padstow, Wadebridge, Rock, Port Isaac, Tintagel and Camelford areas and repatriation on a global basis. If you're interested in finding out more about a Perfect Choice Funeral Plan with us, please call us on the above number. We can send you a free, no obligation information pack, talk through your wishes over the phone or in the comfort of your own home. We will guide you through every step and make it as easy and stress-free as possible.